If you were the kind of kid who hid your greens under your mashed potatoes, this Shakeology smoothie recipe is for you. Believe it or not, if you’re a veggie hater, you can start your day off with a heaping helping of greens and barely notice them. 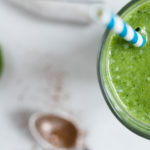 This Green Coconut Shakeology features a packed cup of raw spinach and is lightly sweetened with creamy Greenberry Shakeology and coconut water for a healthy morning smoothie that’s deceivingly delicious. Make sure you don’t run out of Shakeology. Get your favorite Shakeology flavors here! Start your day with this satisfying spinach smoothie that's lightly sweetened with creamy Greenberry Shakeology and coconut water. Place coconut water, ice, Shakeology, and spinach in blender; cover. Blend until smooth. A great protein and veggie as part of breakfast.